I am trying to keep on top of the block swaps that I am participating in, and ultimately for me that means finishing the blocks as the envelopes with fabrics come in the mail box. Once filed they may be forgotten! Donna from Craftjunk asked for two 10.5 inch blocks featuring simple and fun geometric shapes. Once completed Donna asked for the pre-cut border as provided to be added to each block. These blocks will be used by Donna to make a quilt for her daughter who is turning 5 in April, and like most little girls that I know, her favorite color is pink. I happened to find this magazine at my local newsagent and could not resist. 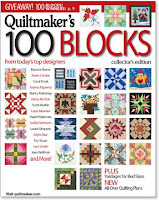 It is a treasure trove of quilting ideas, and ideal for block swap inspiration. All of the blocks in the magazine finish at 12 inches, and most of them are relatively easy to re-size. Are you sick of seeing Half Square Triangles yet again? Always happy to see half squares! Hehe They're gorgeous Rita... it's going to be on amazing quilt for a lucky little girl. nope! i just tried my hand at these the first time the other day and they're fun! oh love that top one - looks like I found my block for one of the quilting bees I'm in (have to make six of the same kind of block but in different colors)! Thanks! I'll never be sick of HSTs! Your blocks are wonderful! Have you participated in a lot of bees? I joined my first two this year. My months are June and August, so I have time, but I think about ideas all the time and nothing seems to gel. Any tips as an experienced bee participant? Is there nothing one can't achieve with a HST? Your blocks are so nice with such beautiful fabric. 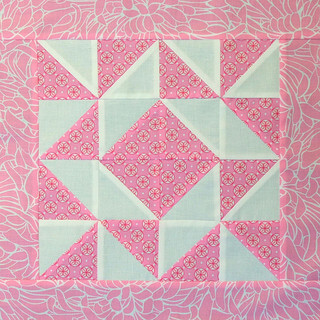 I enjoy usng half square triangles a lot, because there are so many ways to be creative using them and fabrics. I find your quilts very nice also. I enjoy your blog a lot. Thank you. Nooooo! Not if you keep serving up fantastic block like those. How wonderful and I'm sure going to hunt down that magazine! 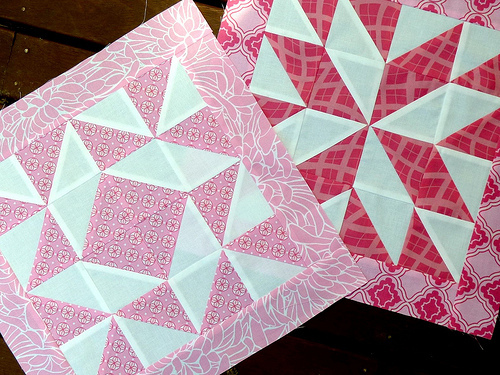 I could never be sick of HSTs - they're the perfect go-to block, so simple, but so versatile! 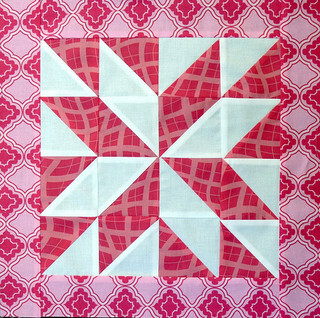 Just spotted your MIL's star blocks - WOW! "Are you sick of seeing Half Square Triangles yet again?" No! I love them! I haven't managed to make anything with half square triangles in yet, so seeing all of yours is keeping my half square triangle fix satisfied! I love these! I need that magazine. No - I love HSTs! Cute blocks! I never get sick of seeing HST's! Never! Lovely block, complex but at the same time there is a "lightness" to it. Must hunt up the magazine for those nights when I need a little inspiration! those are really pretty blocks. i like the idea of giving people the freedom to do something geometric that they'd like but with a defined border. I am amazed at how much can be done with half square triangles. Such a simple start for some very ornate blocks. And the fabric is tasty. Do you know who they're by? Keep the half square triangles coming! These blocks are too cute. My granddaughter (age 3 1/2)would love them because of course pink is her favorite color! I'll never be sick of HST's -- they're so versatile. And I Looooove that first block! Ooooh!! Pink, pink, pink. Love it!! !